That was very impressive Sigrid. Did you design the layout? I’d be interested to learn it. For a long time, I have used several layouts like the grand tableau, or another layout based on 12 cards with a significator card, and this and this and that … and they were great, but then there is THIS layout. Not to say, the others don’t work or are inappropriate in any way, but this works better for me, and my students gave me good feedback too. I do feel privileged to have been passed on this tradition. It is the best companion to my Tarot de Marseille and the Triad Oracle which I also use. In the book, I analyze several layouts around different topics : love, events, work, moving place, … and I break down the layout explaining how to read it … I am currently writing about it, and live classes though skype could be interesting, it would add some live energy, with several students exchanging readings and analyzing the whole thing together. I’d be very interested to see that so please keep me posted. I’ve just started to re-use the GT thanks to a thread at Aeclectic, which is how I found your blog. 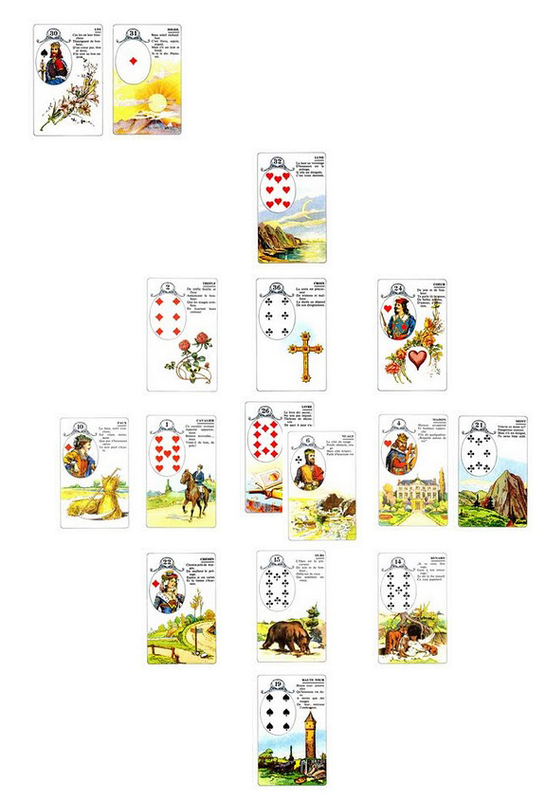 Mostly though I use the Lenormand as a pre-reading. I’m hoping to change that though, but in the UK people really don’t know these cards. I use the Marseille too for most of my professional readings, and I do have the Triad but I’ve struggled to connect to it. I have a friend in Paris who has told me a few myths about it which I find interesting – it seems to have a strong energy and people love it or hate it. On the other hand, I don’t use the RWS anymore only the Tarot de Marseille. The Lenormand is indeed a good way to start a session and you may actually find a lot of information in it that is useful for the querent ! I will keep you posted. Just send me an email if you wish and I will put you in the database.